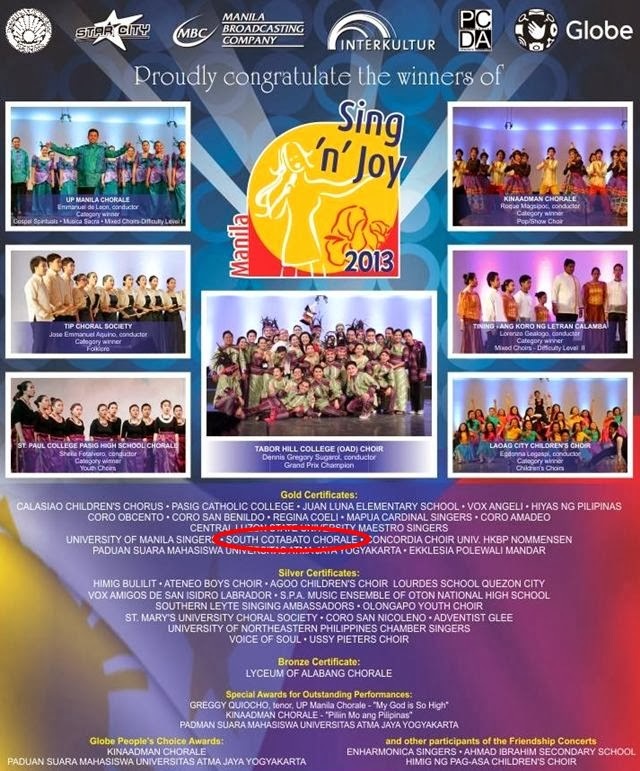 South Cotabato Chorale brought home the Gold Certificate honors in the recently concluded Sing N Joy Manila 2013, an international chorale competition held at the Aliw and Star Theaters in Pasay City from December 11 - 14. A total of 45 choirs from the ASEAN region participated in Sing N Joy Manila 2013. The competition was divided into the following categories: children and youth, musical sacra, folkloric, pop, gospel/spirituals, and mixed chorus. The South Cotabato Chorale earned the Gold Certificate in the Folkloric category.